Sandy and I did this short hike on November 15. 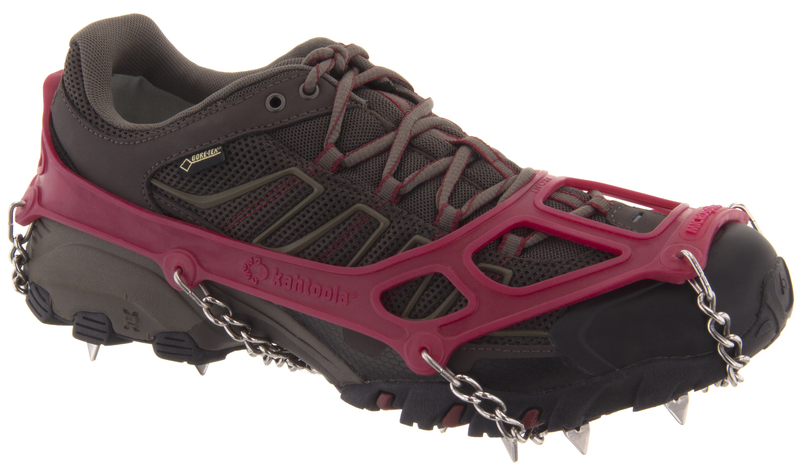 There wasn’t much snow but I brought my new microspikes from Kahtoola. The Johnston Canyon trail is closed for reconstruction so we had to go through the next trail to the north to access the ink pots. It’s a short hike with relatively small elevation gains. It is steep in sections but pretty much anyone could do it. It did have icy sections that were slowly melting. It took us about 2 hours to get up. We wandered a bit then headed back down. The melted areas were freezing by now so I put on my spikes. The spikes were great. They have a stainless chain base with stainless triangle spikes. The top is a high strength Elastomer that fits snug on your boot. The chains and spikes dug in to the ice and prevented me from sliding backwards or forwards. I wanted to see how strong they were and how well they gripped so I climbed a bit of the hillside. They dug deep and didn’t let me go anywhere. I can’t wait to try them again. They stood up and had no real issues. The only thing that caused a slight issue was because the snow was a bit soft in areas, the snow built up between my boot and the chains so every few feet I had to hit my boot to clean out the snow. Next time, I am going to try and pull them higher on my boot so it fits tight along the underside. I suggest picking up a set if you are going anywhere in the mountains in winter.